Wrought iron as a form of decoration, not only inherits the traditional function and technology, combined with modern technology, more the romantic emotional appeal and the east European art, simple, elegant body. Ultra-quiet quartz movement, not only keep accurate time, help you to achieve a good sleep and enjoy your every comfortable life moment. Also suit for living room, kids' room, bedroom, kitchen, dining hall, office, cafe, restaurant, bar or hotel etc. Can be used for gifts,crafts, business gifts, holiday gifts, promotion gifts, home decoration. 1. Please use 1 AA carbon zinc battery only (alkaline battery or rechargeable battery which may have influence on the life span of clock movement, as well as the accuracy of the time). 2. Due to battery is limited in international transport, it' s NOT contained in package, you may purchase it from local store, hope you could understand it. 3. Due to the light and the display resolution, pictures and real objects may have slightly color difference, and manual size measure may occurs a little error, please refer to real products. 1. In case the rear cover of the clock is too tight to be removed, you may prise off it with a sharp tool, or pull it with the rope fixed on the rear cover dot. Please refer to the last page of the product manual. 2. If you find the clock not in working conditions, maybe certain parts got loose during transportation. Please feel free to contact us to exchange it or apply for a full refund! 3. For any serious quality problems, please contact us to exchange it or apply for a full refund, we promise you a 100% satisfactory service. 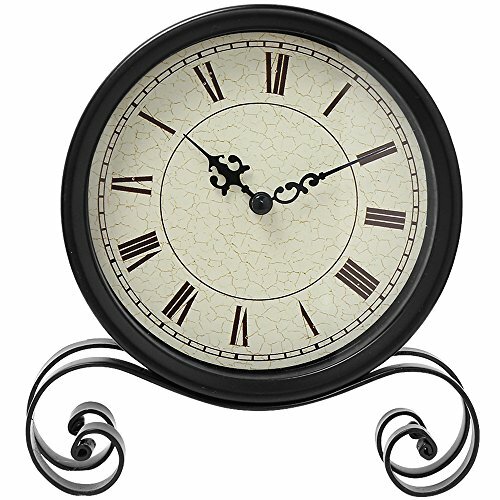 Retro classical design europe style clock, Vintage housing calls to mind 1940s-era designs. Its dimensions are ideal and will fit on most of the shelves in the house. It is also of a perfect size to create an impression and display its elegance look. Please use 1 AA carbon zinc battery only (alkaline battery or rechargeable battery which may have influence on the life span of clock movement, as well as the accuracy of the time). If you have any questions about this product by astill, contact us by completing and submitting the form below. If you are looking for a specif part number, please include it with your message.